Three years ago myself and Nicola had our first foray into Michelin dining when we had lunch at Marcus Wareing at The Berkeley. Our meal was fantastic and to this day still stands out as one of the best meals that we have eaten. 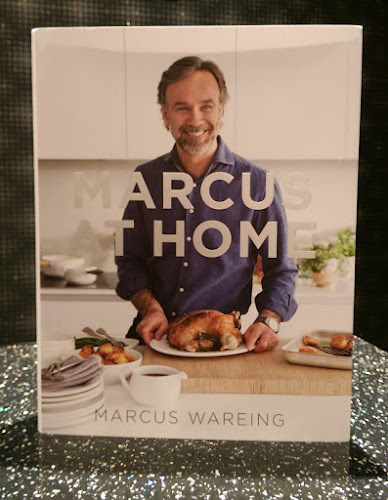 As with many top chefs, Marcus likes to keep busy and in addition to adding two other restaurants the Marcus Wareing Restaurant group, he has just released his sixth cookbook, Marcus At Home. The book is a collection of recipes for dishes that Marcus cooks at home for friends and family and in Marcus At Home, he’ll show you how to bring these delicious recipes into your home cooking. 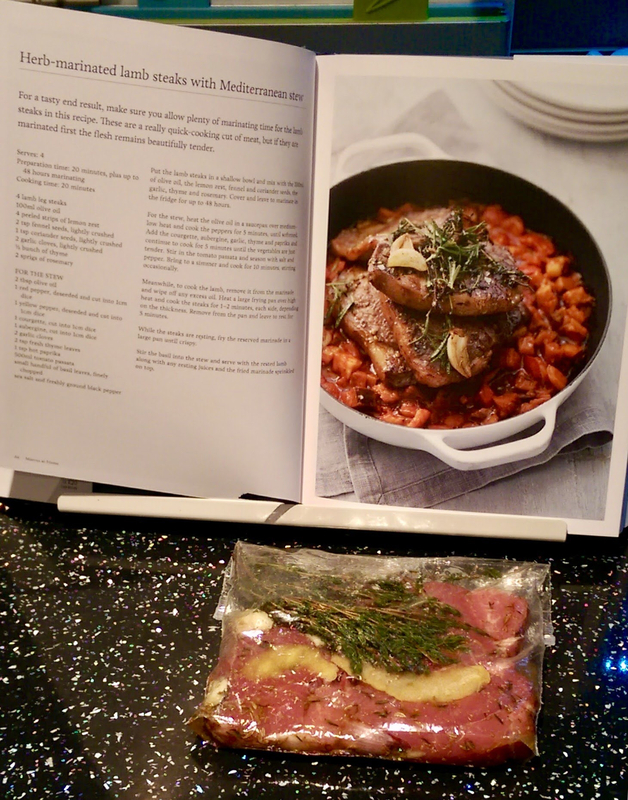 I was recently sent a copy of Marcus at Home to review (coming soon) and have already managed to recreate a few recipes that proved a huge success with my own family, I wanted to share this fantastic lamb recipe with you all. 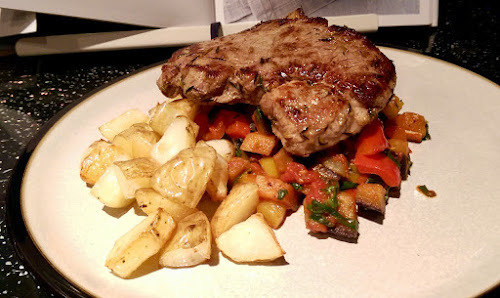 For a tasty end result, make sure you allow plenty of marinating time for the lamb steaks in this recipe. These are a really quick-cooking cut of meat, but if they are marinated first the flesh remains beautifully tender. Put the lamb steaks in a shallow bowl and mix with the 100ml of olive oil, the lemon zest, fennel and coriander seeds, the garlic, thyme and rosemary. Cover and leave to marinate in the fridge for up to 48 hours. For the stew, heat the olive oil in a saucepan over medium low heat and cook the peppers for 5 minutes, until softened. Add the courgette, aubergine, garlic, thyme and paprika and continue to cook for 5 minutes until the vegetables are just tender. Stir in the tomato passata and season with salt and pepper. Bring to a simmer and cook for 10 minutes, stirring occasionally. Meanwhile, to cook the lamb, remove it from the marinade and wipe off any excess oil. Heat a large frying pan over high heat and cook the steaks for 1–2 minutes, each side, depending on the thickness. Remove from the pan and leave to rest for 5 minutes. While the steaks are resting, fry the reserved marinade in a large pan until crispy. Stir the basil into the stew and serve with the rested lamb along with any resting juices and the fried marinade sprinkled on top. The recipe calls for the lamb to be marinated for up to 48 hours but I only managed to marinate my own lamb for 24 hours although the lemon, thyme and garlic had still managed to permeate the meat resulting in a deliciously tasty end result. The lamb was juicy, tender and full of flavour, working well with the rich vegetable stew. So, providing you plan ahead and get your meat marinating, this recipe can be brought to the table in just over 30 minutes. Give it a go and let me know how you get on. Marcus At Home is published by Harper Collins and is available to buy at all good book shops or from Amazon.